Well, this review by the Cochran Collaboration suggests it does matter — at least for chronic neck pain. Overall, people receiving acupuncture had better pain relief immediately after treatment than those getting sham treatments such as transcutaneous electrical nerve stimulation (TENS) or laser with the machines switched off, or acupuncture with the needles inserted in the wrong place. 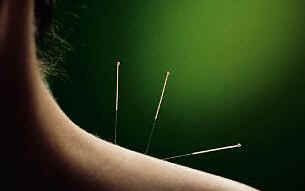 Furthermore, people who had acupuncture also reported better pain relief than those on a waiting list for treatment. In one small trial, acupuncture provided better pain relief in the short-term than massage therapy. These results are based on a reanalysis of 10 studies of more than 600 patients. The lead author, Dr. Kien Trinh from McMaster University, Hamilton, Canada says the next step is to look at the long-term response to acupuncture. This entry was posted on Wednesday, February 21st, 2007 at 10:27 AM	and is filed under Acupuncture/ pressure, Pain, TENS/FNS/VNS. You can follow any responses to this entry through the RSS 2.0 feed. You can leave a response, or trackback from your own site.